Perfect for interviews, table tops, still photo shoots or small audience sets, you can shoot your production in Full Moon’s 35x24 stage (800 sq.ft.) with a 10 foot ceiling. The walls are painted white with a black theatrical curtain around ¾’s of the entire area. The floor is CBS gray. Currently, the studio is equipped with the newest Sony DVCAM camcorders, the DSR-570s. You have the choice of recording directly inside the camera or to many different formats in the equipment room. You can rent the cold stage alone or with a complete grip and lighting package. 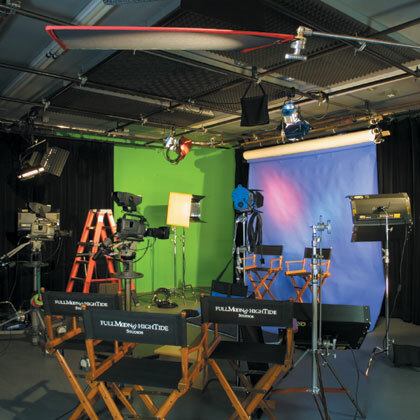 The studio is also available with a complete TV control room for multi-camera productions.